A hitherto untouched stretch of land on the Dominican Republic’s northern shore is now home to the Aman group’s 29th retreat, Amanera. Artfully scattered over 60 foot cliffs, which overlook Playa Grande beach, the resort respectfully slots into its lush environs, which includes jungles, waterfalls and the spectacular Cordillera Septentrional mountain range. Ensconced in any one of the 25 casitas, guests can expect to encounter designer John Heah’s raw, organic interiors which incorporate stone from local quarries, indigenous handmade Aguayo tiles and Dominican art and artifacts, while floor-to-ceiling windows give way to views of landscaped private gardens. Combining the Sanskrit word for peace (aman) with the Taino word for water (neara), the property’s moniker aptly summaries Heah’s design concept, where water is present from every angle. The resort is the first golf-integrated Aman, with an 18-hole course originally designed by Robert Trent Jones and re-designed by his son, Rees Jones to fit within the new Amanera landcape. 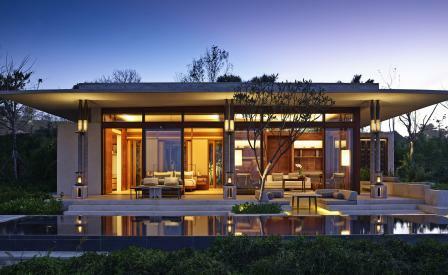 And what would an Aman resort be without one of the group’s signature spas? Offering therapies based on traditional energy-based shamanic healing, Amanera’s luxe relaxation hub soothes and subdues in typical Aman fashion.